Port Townsend, today. The Army Corps of Engineers got the green light to blast a hole last night in a levee on the Mississippi River. 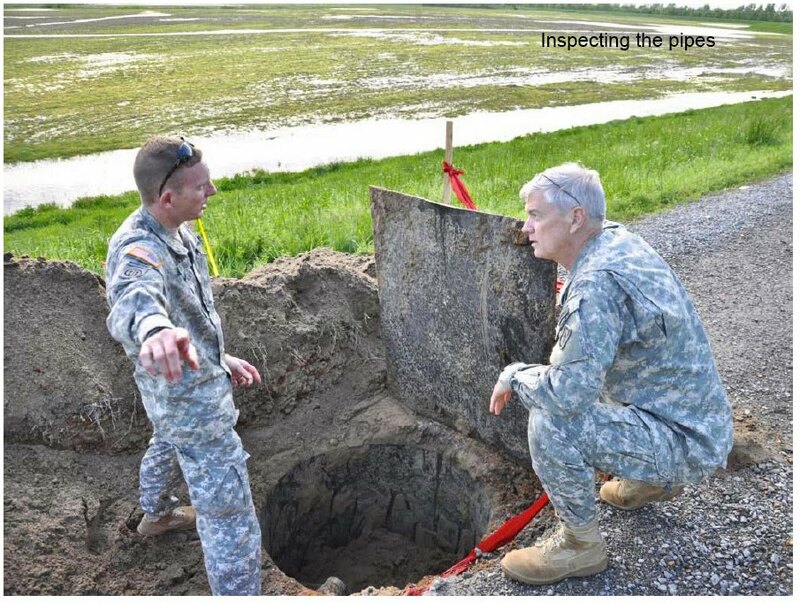 Unfortunately, the story as I have seen it presented, speaks more to the flooding of homes and farmland, than to the rational behind the breach. There is a legal term - Balance of Harms - that roughly means "to weight the harm created by allowing an action, against the harm incurred if the action isn't carried out." 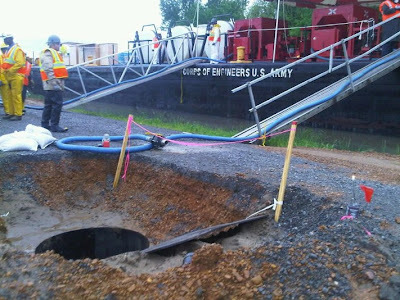 Which, in this case, put the Army Corps of Engineers between a rock and a hard place. Read on. The blast opened the upper "fuse plug" built into a levee, allowing the Mississippi River to flow into the Bird's Point - New Madrid (BP-NM) Floodway. 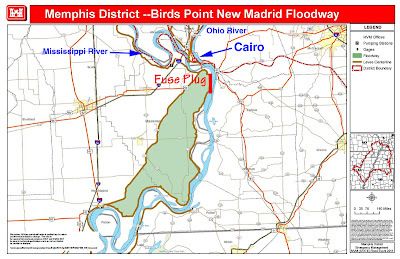 This to minimize flooding and possible destruction of Cairo, Illinois, and three other communities. And, relieve pressure on more than 200 miles of levee on the Mississippi between Cairo Illinois and New Madrid Missouri. The result was the flooding of farm land, and potential destruction of 88 homes. Cairo Illinois sits at the confluence of the Mississippi and Ohio Rivers. 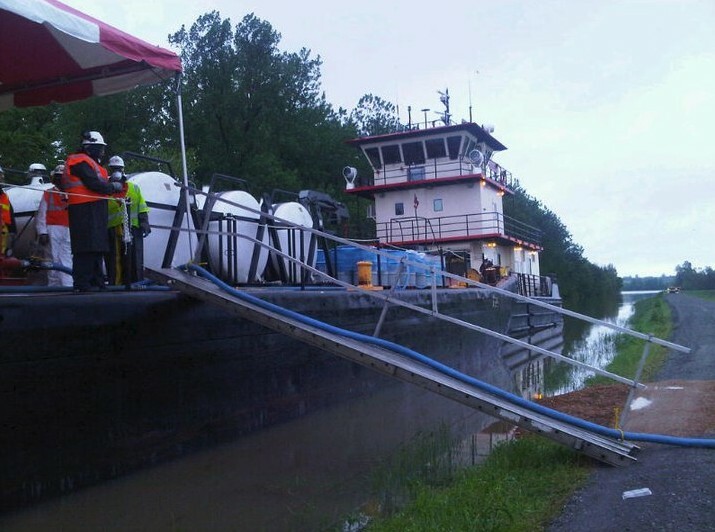 Recent bad weather in the Mid West has raised the Mississippi River at dangerous levels. 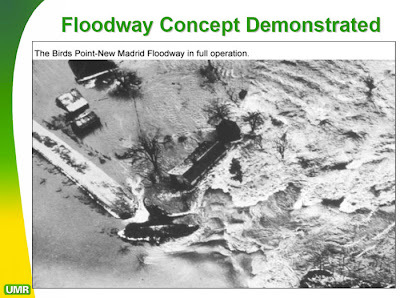 The BP-NM Floodway is part of a risk management plan, authorized by Congress. 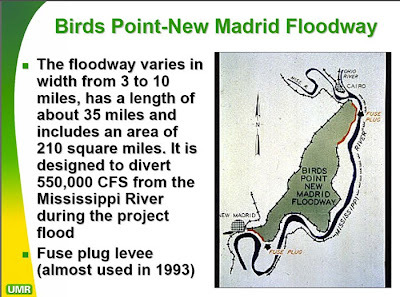 In 1985, two feet were added to the top of a 2 mile long section of levee at Bird's Point. 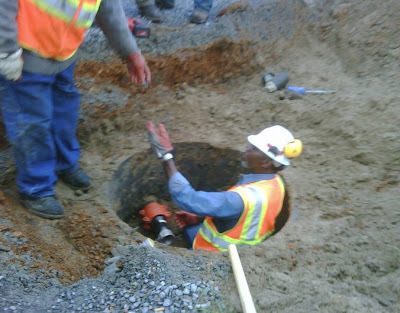 A system of plastic pipes was installed, creating a "fuse plug." 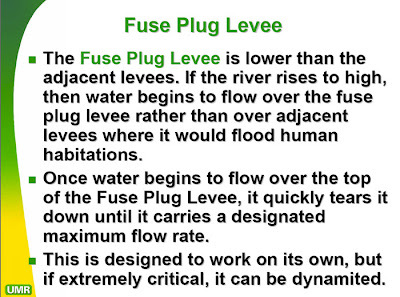 See page K7-8 for a full description of the fuse plugs, pipe diagram, and how explosives are applied. When conditions dictate, liquid explosive is pumped into the fuse plug and detonated, allowing excess river water into the Floodway, which is bounded by it's own set of levee's, reducing flood damage and possible breech of levees down stream. Residents living within the Floodway, do so at their own peril, with full knowledge that the Floodway may, at some time, need to be activated. The land area is clearly defined. 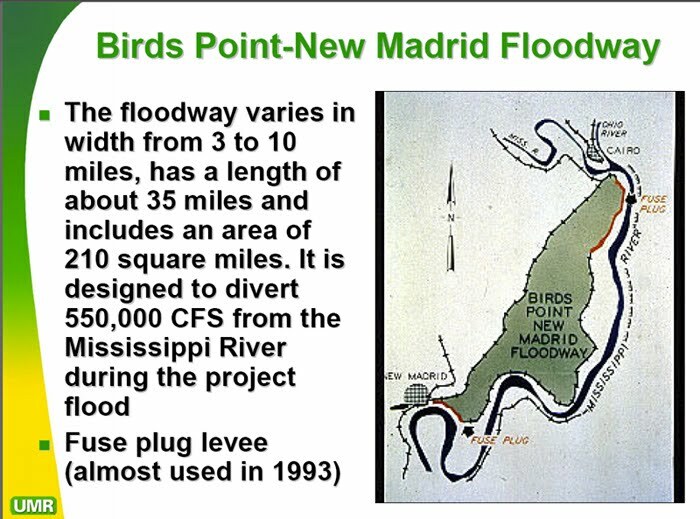 The Floodway has levees to contain it with in the defined land area. 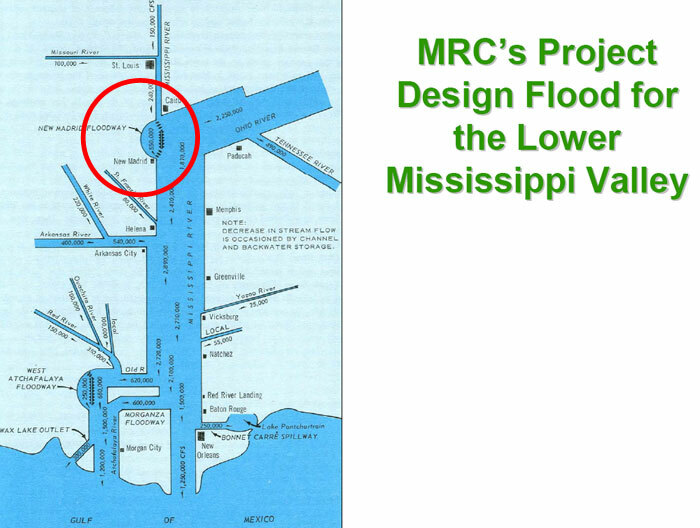 "The 1928 Flood Control Act give the President of the MRC (Mississippi River Commission) the authority to operate (open) the BP-NM Floodway when the Mississippi River reaches 58 feet on the Cairo, Illinois gage with the prediction to rise to 61 feet and rising." 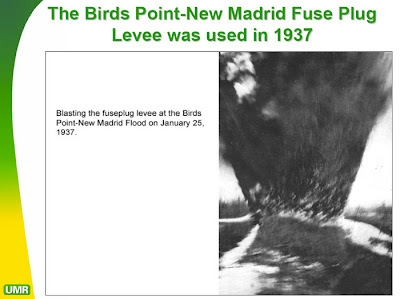 From "Evolution of the Levee System"
The plan had emotions running high both in favor and against "pulling the plug." In a disgusting video clip, Missouri House Speaker Steve Tilley(R) was captured making disparaging remarks about saving Cairo Illinois or farmland. 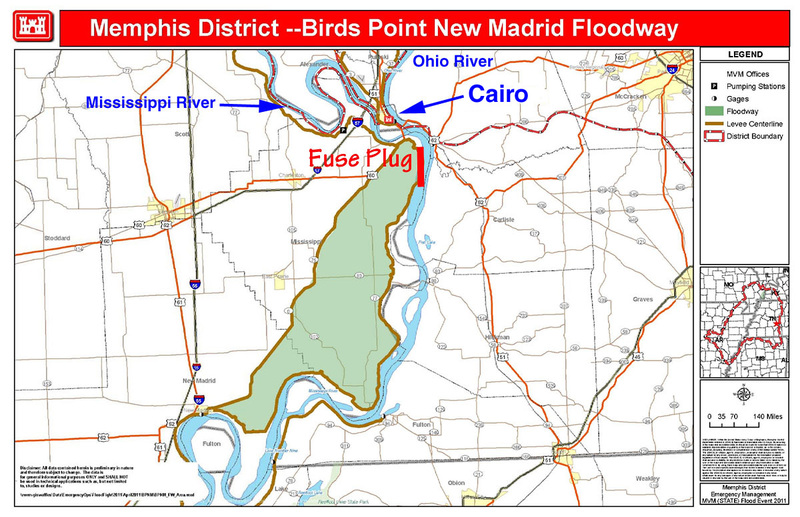 The State of Missouri filed a lawsuit seeking to prevent the Army Corps of Engineers from blasting the plug to open the Bird's Point - New Madrid Floodway. 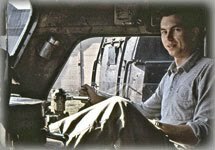 This action was countered by the State of Illinois, citing, in part, the notion of Balance of Harm, wherein consideration must weigh the "the lesser of evils" choice. The action went all the way to the US Supreme Court, where it was rejected, based largely in part on the notion of Balance of Harm or Balance of Equities. 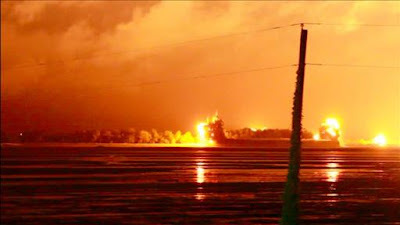 Missouri House Speaker Steve Tilley(R) issued an apology, regretting his insensitive remarks about Cairo, Illinois. 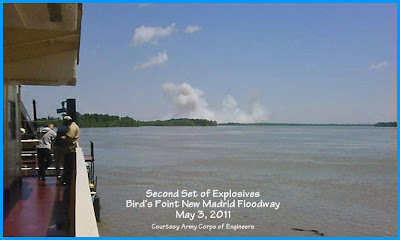 Finally, the Army Corps of Engineers ignited a second series of explosives at the fuse plug just hours ago. Good for the Speaker for stepping up and apologizing for his disgusting remarks. It doesn't make them right but at least he had the decency to own up to them. Thank you for your kind words. It's gratifying to know I have inspired you to begin your own Blog. Let us know when you begin posting!